Cap: applanate to centrally depressed, but usually strongly irregular; 40 - 60 mms diameter; strongly radially ridged and zoned in different shades of blueish brown, darker at center, with a cream outer ring. Stipe: central or eccentric, cylindrical but irregular, hollow; 60 - 160 × 4 - 8 mms; dark brown, velvety to felty, attached to roots or wood. Pores: subdecurrent, 5 - 7 per mm; white to cream; bruising red; turned brown by the spores. 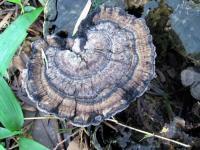 Notes: this fungus can be recognized by its woody radially ridged blue brown-zoned cap, tall stipe attached to buried wood and small pores staining red brown when damaged. Widely recorded in the Pacific region and elsewhere in the subtropics.Taxonomist disagree on whether the correct name should be A. rugosum or A. subrugosum.